Social: IRL is based in the heart of the midwest in Lawrence, Kansas. We are proud of the game-changing innovation and thriving online communities in our local area. In today’s post we look at the Social Media Club of Kansas City, a dynamic and fast growing group of social media enthusiasts who share Social: IRL’s values of advocacy, education, outreach and of using social media to make a positive impact both online and offline. From six people getting together in a coffee shop in 2008, to a thriving community of more than 2,000 members today, the Social Media Club of Kansas City is making an impact. SMCKC has grown to become one of the largest and most active chapters of the national Social Media Club. To quote Jessica Murray, Community Manager for the national SMC organization, “We’re inspired by the activity and hunger in the Kansas City community around social media and have so much gratitude towards the leadership team.” But beyond that the group has become a significant resource for the entire Kansas City area. Not only reaching out and connecting Kansas City’s thriving social media community, but becoming widely recognized as passionate educators and advocates for technology literacy. Social: IRL chatted with SMCKC President, Joe Cox, to learn more about what’s brought the group to this point, how to connect and get involved with the group, and what we can expect to see new or different from SMCKC in 2012. Could you share a little on the background of SMCKC – how the group started, the mission of the group, and how that mission has evolved as the group has grown? The group was started in June of 2008, by Ed Roberts and Zena Weist through an email to get people together to talk about what was going on with social media. Beginning with a meeting of six people at a coffee shop, it was totally organic and was started out of curiosity and passion, traits that still give us strength as a group today with over 2,000 members throughout the city. The mission of the group at first was to facilitate conversations and best practices to help wrap our heads around what was happening with communication through social networks. We were all having these conversations online, but needed somewhere to go offline to get that personal human interaction that we needed. Now four years later, we’re transitioning into a group that at it’s core is there to promote, educate & serve as an advocate for technology literacy for Kansas City and it’s communities. We balance that with giving our community awesome events to attend with great speakers as well as a place where social media professionals can still get the content that they need to continue to learn of best practices and have conversations with peers. SMCKC currently has over 2,000 members and is one of the largest and most active Social Media Chapters in the nation. To what do you attribute that success? Growing up in the midwest, I think everyone remembers what it was like before social media. It took a long time for trends & ideas to come from the coast all the way to the center. It was months before we were wearing Hammer pants. Social media gave cities like Kansas City a voice and evened the playing field, allowing us to distribute our vision, ideas & messages outward. I think we really like having that voice and it shows through our membership’s interest. Who typically attends SMCKC meetings? Just like social media, our group is diverse when it comes to who attends our events. We have professionals that work inside social media as well as people that just think Facebook is an awesome place to share their blog amongst family & friends. Entrepreneurs to enterprise, and tech savvy to tech illiterate. The trick is finding a way to serve everyone and create valuable content & events for all of the different folks out there that are involved. The foundation of SMCKC is the monthly breakfast meeting. What other opportunities are there to get involved with the group? As the group grows, there are tons of ways to get involved. We’re shooting for at least 3 events a month in 2012, and that takes a lot of help coming up with ideas, organizing and helping us manage. We’re always looking for help and you can get a hold of Aaron Deacon, our Events Chair, with any good ideas or if you’re interested in helping. We also love content and depend a lot on our community to help us write our blogs, keep the #SMCKC hashtag & Facebook conversation active, and help promote our calendar of events. We’re always looking for people to help fill content roles and you can reach out to our Community Chair, Katy Schamberger, if you’d like to contribute. SMCKC has seen some great accomplishments over the last year. 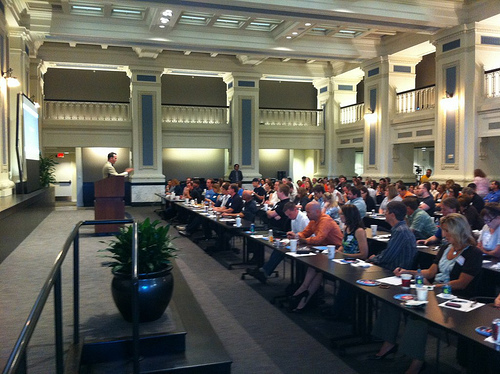 From your perspective, what do you consider to be the most successful SMCKC projects (or meetings) from 2011? Bringing Scott Monty into KC to talk about Ford’s strategy in Social Media was huge, but I’d have to say the biggest local impact we made was our GigabitCity event at the Kansas City Library & our continued efforts with the GoogleFiber movement here in KC. Bringing some of the smartest people in Kansas City together for an all day ideation session on what gigabit speeds will mean to Kansas City’s communities & citizens was a huge win for us and really helped legitimize what we’re trying to do for KC. A huge thanks to Mike Brown & Brainzooming Group, who facilitated that event. Couldn’t have done it without them. As SMCKC continues to grow, how can you most effectively meet the needs of such a diverse membership? Have you considered more niche or targeted events for specific types of members? Being a social media club, our community is very vocal online and through monitoring our #SMCKC hashtag & other watercoolers around the internet, we can pick up a good amount of what is working, what isn’t & what we should do more of. As we grow, we absolutely see the need to target more content & events at different parts of our group and just like our focus on our professional membership activation in 2012, we’ll continue to grow to those needs of the community. What else can we expect to see new or different from SMCKC in 2012? Are there specific goals set for the group you can share with us? We know how important offline & online communication is, and balancing both. We’ll be taking a new focus on bringing great influencers, speakers, authors and thought leaders to KC from outside of the city to speak to our group. At the same time we’ll continue to emphasize & build out our online messaging to help reach out, promote, advocate & have better conversations with our membership more effectively. In 2012 our focus is on uniting and activating our advocates and continuing to provide the best and most valuable content & events to our members. For someone who hasn’t yet attended an SMCKC meeting, where can they find details of upcoming events and what would you say to encourage them to attend? We’re a really open & fun group and wherever you are with your knowledge on tech or social media trends, you’ll get something from our speakers, events or networking. Another cool thing about us is that your able to stalk our events and group online to see what we’re all about and make some connections online before you ever set foot into our events. This way, you never have to worry about not knowing anyone when you walk through the door. Another thing that I love about our group is it’s networking for people that hate traditional networking. People lead with conversations, not with their business cards. A good place to join the group and the conversation is by heading to our website at smckc.com. Once you’ve signed up and checked out our calendar of events, hop on twitter and follow our #SMCKC hashtag to see what’s going on with us in real time. Somebody is always on and it’s a good place to get questions answered by our members. Social: IRL are proud to be active members of the SMCKC group and have appreciated support from the groups leaders and membership. On February 9, Social: IRL is hosting a special full-day workshop in Kansas City, “Rethinking Business in the Age of the Social Consumer.” The event features “Conversation Agent” Valeria Maltoni and a diverse group of local, regional and national businesses, organizations and agencies, who will spend the day in an interactive discussion that goes well beyond the typical social marketing dialogue. We are grateful to SMCKC for supporting and participating in the event.